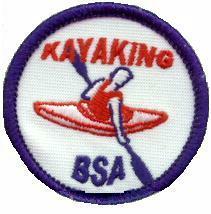 The Kayaking, BSA Patch is NOT worn on the Uniform. Before fulfilling the following requirements, successfully complete the BSA Swimmer test. Describe various types of kayaks and how they differ in design, materials, and purpose. Name the parts of the kayak you are using for this exercise. Demonstrate how to choose an appropriately sized kayak paddle and how to position your hands. Tell what precautions must be taken for a safe trip afloat. Demonstrate how to select and properly fit a PFD. Explain the importance of safety equipment such as PFD's, air bags, grab loops, and helmets. Capsize your kayak in water at least seven feet deep, perform a wet exit if necessary, and swim the boat to shore. With assistance, if needed, ready the capsized craft for use. Show how to approach a capsized paddler in your kayak and tow him to shore. While upright in your kayak, right a capsized kayak, empty it of water, and assist the paddler aboard without returning to shore. Entering and launching a kayak from shore or dock. Landing or docking and exiting a kayak. Paddle forward in a reasonably straight line. Move the kayak sideways to the right and to the left. Pivot 360 degrees to the right and left. This badge can be earned concurrently with the Kayaking Merit Badge but earning one does not automatically qualify the Scout as earning the other. The Worksheets below contain information on, and can be used for, either or both the Kayaking BSA award and the Kayaking Merit Badge, and indicate which requirements correspond in whole or in part to requirements for the other award.